Eddie Motorsports newest product line is our affordable high quality billet aluminum steering wheels. These wheels are CNC machined in our Southern California facility. 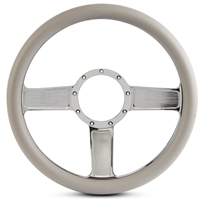 They can be purchased with a raw machined or highly polished finish or with one our Fusioncoat colors. The half-wrap grips are included in the price and are available in black, grey, tan, and red (specify when ordering). You can also wrap the wheel with your interior’s matching leather or vinyl. The wheels are 13 1/2” in diameter. GM adapters and horn buttons are available and sold separately. Look for many new steering wheel models from Eddie Motorsports in the very near future!